The 2016 Lautenberg Act amendments to the Toxic Substances Control Act (TSCA) expanded and enhanced Congress’ vision for how the Environmental Protection Agency (EPA) should evaluate and mitigate the potential risks of chemicals. The industry’s interest is simple: The fewer exposures to a chemical EPA looks at, the more likely it is to find those it does look at safe. The original TSCA was intended to encompass the full lifecycles of chemicals, from manufacturing to use to disposal, authorizing EPA to regulate any of those activities. It gave EPA co-authority with the Occupational Safety and Health Administration (OSHA) over chemical exposures in workplaces and with the Consumer Product Safety Commission (CPSC) over chemical exposures from consumer products. And it provided a wide array of means by which EPA could regulate chemicals to address unreasonable risks it identified, ranging from requiring warnings to limiting the amount of a chemical that could be used in a certain way to an outright ban on all uses of a chemical. Unfortunately, the original law also contained fatal flaws that rendered this vision unachievable in practice. Congress finally stepped in to address those flaws through the 2016 amendments. But the amendments also did something else: they added several elements that further expanded what EPA was to include in addressing chemical risks. Congress explicitly required that EPA identify and protect against risks not only to the general population, but to vulnerable subpopulations at potentially greater risk due to heightened exposure or greater susceptibility to a given exposure. It mandated that EPA prioritize chemicals, and evaluate and regulate their risks, under the chemicals’ “conditions of use,” a term Congress defined broadly to encompass not only the full chemical lifecycle, but also all of the “intended, known, or reasonably foreseen” activities that occur at each lifecycle stage. And Congress directed EPA to determine whether a chemical’s risks were unreasonable and warranted regulation based solely on its effects on human health or the environment, without regard to costs or other non-risk factors. Only after EPA completed its science-based evaluation of risks and determined regulation was warranted, was EPA to consider costs and other non-risk factors, and then only in deciding how best to eliminate the unreasonable risk. Congress also retained the provision of TSCA that relegates to the very last step any consideration of whether other authorities – be they EPA’s or other agencies’ – could be used instead of TSCA. Each of the new elements has a strong basis in the large body of science that has emerged over the decades since TSCA first passed in 1976 that elucidates how we are exposed to chemicals, how they can affect our basic biology, and how variability in the human population mediates the potential impacts. Any objective reading of the new law would lead one to expect, therefore, that the breadth and depth of EPA’s chemical risk evaluations would grow considerably. And for most of the first year after passage of the new law, that was where things appeared to be heading. A year ago EPA issued its final rule governing risk evaluations that was a 180° turn from its earlier proposed rule, by asserting sweeping authority to ignore known conditions of use and the resulting exposures to dangerous chemicals, including exposures to workers or consumers and exposures to chemicals like asbestos that are still in widespread use though not domestically manufactured. The rule closely mirrors the chemical industry’s wish list, not surprising since it was drafted by an EPA political appointee that had arrived fresh from the American Chemistry Council. The industry’s interest is simple: The fewer exposures to a chemical EPA looks at, the more likely it is to find those it does look at safe. The final rule strays so far from the law that EDF and 14 other health, labor and environmental groups are challenging the rule in court. But EPA has now applied that rule to specific chemicals – and the results are even worse than expected. Last month, EPA issued so-called “problem formulations” for the first 10 chemicals it is charged with evaluating under reformed TSCA. They represent an astounding retreat from both the spirit and the letter of the law as well as from use of the best available science. I’ll use the rest of this post to describe one of these 10 documents for a chemical called 1,4-dioxane. EPA classifies 1,4-dioxane as a likely human carcinogen; it’s also toxic to the liver, kidney, and central nervous system as well as to aquatic plants and invertebrates. This chemical is produced for intentional use as an industrial solvent; in adhesives and sealants; in wood pulping; in animal and vegetable oil extraction; in textile processing; and for many more uses. It is also present as a byproduct contaminant in many products, including detergents and other cleaning products, and cosmetics and other personal care products such as deodorants and shampoos. Exposures can occur through direct contact with the chemical by workers in industrial facilities making or using the chemical, or from contact with commercial products or processes using it. Consumers using products where the chemical is present as a byproduct contaminant can also be exposed. Exposures can also occur through the environment: EPA estimates that 700,000 pounds of the chemical are released every year into air, water and waste, which can in turn lead to exposures of both humans and other animals and plants. So, which of these exposures will EPA be examining in conducting its risk evaluation for 1,4-dioxane? In this case, it’s more telling to examine the much longer list of exposures EPA will NOT look at – those it will formally exclude from its risk evaluation, based on the authority it illegally claims to have under the new law. First, EPA will not consider any exposures to consumers. None. It argues that the myriad consumer exposures to the chemical as a byproduct contaminant in everyday products don’t count, because they are not “intended conditions of use.” But recall the law requires that EPA look at known and reasonably foreseen, as well as intended, uses of a chemical. EPA will also exclude worker exposures to the chemical where it is a contaminant in industrial or commercial products they use in their jobs. The chemical and formulated products industries pushed hard for EPA to exclude any consideration of the chemical as a byproduct (see here, here and here), and they won. EPA says it may look at byproduct exposures at some point in the future, when it gets around to looking at the parent chemicals that give rise to 1,4-dioxane as a byproduct. But that future look, if and when it happens, will be done in isolation from other exposures to the same chemical, and hence won’t represent people’s actual exposure to 1,4-dioxane. Second, EPA will ignore all emissions of the chemical into the air coming from all commercial and industrial stationary sources, and all associated inhalation exposures of the general population or terrestrial species. To justify this sweeping exclusion, EPA goes farther even than it did in its final risk evaluation rule. It asserts that the existence of authority under the Clean Air Act (CAA) to regulate 1,4-dioxane suffices to assume that the known air emissions – an estimated 135,000 pounds annually – pose no risk whatsoever. Yet the CAA regulates only certain industrial sources of the chemical, and does so using a technology, not health-based, standard. EPA devotes two short paragraphs to dismissing these exposures and risks. It has not conducted any assessment of the breadth or effectiveness of the CAA standards or the risks posed by the emissions that are legally allowed under those standards. It ignores Congress’ clear mandate to consider those exposures in combination with other exposures to the same chemical. Finally, it illegally moves to the very front of the risk evaluation process a step – consideration of whether other legal authorities could be used to address a risk – that Congress required EPA to undertake only at the very end, after considering all of the risks a chemical presents in completing its risk evaluation. Third, EPA will ignore all exposures through drinking water, because of the mere existence of the Safe Drinking Water Act. There is no National Primary Drinking Water regulation for 1,4-dioxane; it is only present on the “Contaminant Candidate List” (CCL), which EPA itself describes as a “list of unregulated contaminants.” Many more steps have to be taken to actually regulate a CCL chemical, which have not been taken for 1,4-dioxane. An estimated 561,000 pounds of the chemical are released to water every year. Recent monitoring by EPA found that 7% of public water systems nationwide serving more than 7 million Americans in 27 states were contaminated with 1,4-dioxane at levels exceeding the level EPA has found to increase the risk of cancer by one per million people, the level EPA generally aims to meet for general population exposures. 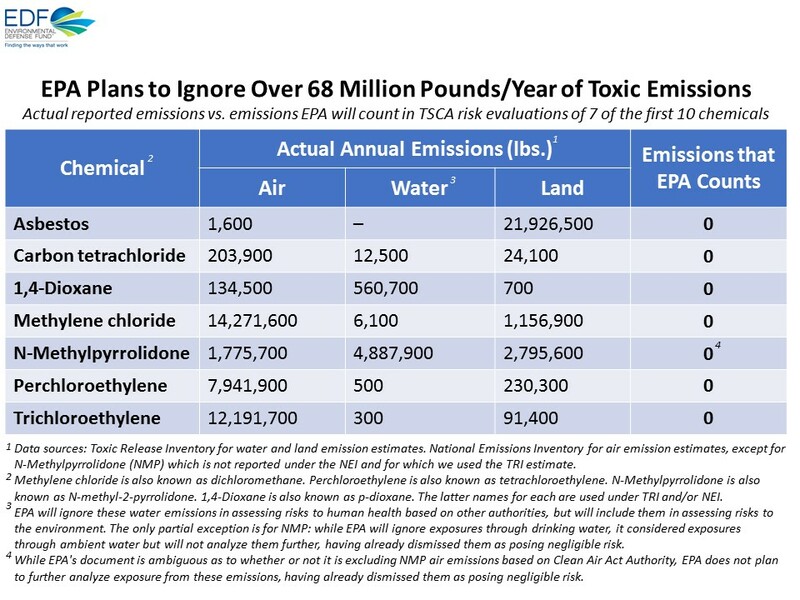 Here again, EPA assumes all of these exposures pose zero risk. I could go on. The document includes numerous further exclusions or conclusions of negligible risk that are based on cursory calculations, assumptions or judgments, with little or no documentation or analysis. What’s left after all this? EPA intends at this point to examine only occupational exposures directly arising from the industrial and commercial uses of 1,4-dioxane it has identified. No consumer or general population exposures will be examined further. But even that limited scope is at risk. Recall that EPA’s risk evaluation rule asserts authority to ignore occupational risks based on the existence of OSHA – something the chemical industry is pushing hard for EPA to do. Lest you think I am describing an outlier, most of the problem formulations for the other nine chemicals have very similar exclusions. And EPA’s documents indicate still more exclusions may be forthcoming as it conducts its risk evaluations. The new TSCA was supposed to restore public confidence in our chemical safety system, by driving robust assessments of chemical risks using the best available science. Instead, under this Administration EPA is taking steps to render implementation of the new law toothless and in some ways weaker than the old TSCA Congress just fixed. All with the aim of elevating narrow industry financial interests over public health, which will suffer severely as a result. This entry was posted in EPA, Health Policy, Industry Influence, TSCA Reform and tagged dioxane. Bookmark the permalink. Both comments and trackbacks are currently closed.